Machupo virus (MACV) is a member of the Mammarenavirus genus, Arenaviridae family and is the etiologic agent of Bolivian hemorrhagic fever, which causes small outbreaks or sporadic cases. Several other arenaviruses in South America Junín virus (JUNV) in Argentina, Guanarito in Venezuela, Sabiá in Brazil and Chapare in Bolivia, also are responsible for human hemorrhagic fevers. Among these arenaviruses, JUNV caused thousands of human cases until 1991, when the live attenuated Candid #1 vaccine, was used. Other than Candid #1 vaccine, few other therapeutic or prophylactic treatments exist. Therefore, new strategies for production of safe countermeasures with broad spectrum activity are needed. We tested a tri-segmented MACV, a potential vaccine candidate with several mutations, (r3MACV). In cell culture, r3MACV showed a 2-log reduction in infectious virus particle production and the MACV inhibition of INF-1β was removed from the construct and produced by infected cells. Furthermore, in an animal experiment, r3MACV was able to protect 50% of guinea pigs from a simultaneous lethal JUNV challenge. Protected animals didn’t display clinical symptoms nor were virus particles found in peripheral blood (day 14) or in organs (day 28 post-inoculation). The r3MACV provided a higher protection than the Candid #1 vaccine. The r3MACV provides a potential countermeasure against two South America arenaviruses responsible of human hemorrhagic fever. Machupo virus (MACV) belongs to the Mammarenavirus genus of the Arenaviridae family and is the etiologic agent of Bolivian Hemorrhagic Fever (BHF) , discovered in 1959. From 1962 to 1964, it caused 515 human cases, 114 of which were fatal . Then, 40 years later, from 2006through 2008, 200 human cases were reported including 12 deaths . Similarly, the 1950s, another arenavirus, Junín virus (JUNV), was responsible for cases of human hemorrhagic fever (HHF) in Argentina . Since 1991, the use of the Candid #1 vaccine, a live-attenuated vaccine against JUNV, decreased the case number . Furthermore, three others mammarenaviruses have caused HHF outbreaks in South America and include Guanarito (GTOV), Chapare (CHAPV) and Sabiá (SABV) viruses [4–7]. Post-exposure passive transfer of human plasma-derived antibodies was used for humans and also non-human primates (NHPs) challenged by JUNV and MACV [3, 8]. However, this treatment induced a late-neurological syndrome . Although Ribavirin reduced lethality in humans, administration at very early stage of infection was necessary  due to its side effects . Therefore, alternative strategies with a broad spectrum activity are needed. Here, we report the use of the reverse genetic strategy to design a potential vaccine candidate targeting MACV and JUNV. Mammarenaviruses are enveloped viruses with a single-stranded RNA genome composed of two segments . Each segment encodes two ambisense genes, separated by a hairpin intergenic region (Fig. 1a). The L segment contains the genes of the small ring finger Z protein and of the RNA-dependent RNA polymerase L protein. In the S segment are found the genes of the viral nucleoprotein (NP) and of the glycoprotein complex (GPC). It was previously demonstrated that the bi-segmented genome of arenaviruses could be modified into a tri-segmented genome, by the duplication of the S segment . To select and maintain tri-segmented viruses, the NP gene was removed from one of the two S segments, and the GPC gene was removed from the second S segment, so that two genes of interest could be inserted into these empty loci (Fig. 1b). Prior studies demonstrated efficacy using this approach for Old World Lymphocytic choriomeningitis virus (LCMV) or the New World JUNV [10, 11]. They constructed a tri-segmented JUNV (r3JUNV) or LCMV (r3LCMV), the latter of which showed high attenuation vs WT and exhibited protection against LCMV challenge when used as a vaccine candidate in mice . In these studies, we used the reverse genetic system applied to the MACV Carvallo strain genome. As illustrated in Fig. 1 we generated three S segments, a wild-type one along with two genetically modified S segments, one harboring the CHAPV strain 810,419 GPC gene (acc # EU260463.1) into the MACV GPC gene locus, and the second displaying GTOV strain INH-95551 GPC gene (acc # AY129247.1) into the MACV NP gene locus. This virus was named r3MACV (Fig. 1b). Thirty three (33) amino acids were deleted from the C-termini of the two GPC sequences, required for production of infectious viral particles , and avoid any competition with the MACV wt GPC. Such a competition might have changed the virus cellular tropism or led to the loss of one of the two modified S segment. Additional modifications aimed to stimulate the adaptive immune response, by insertion of mutation (D380A in NP gene), shown to prevent the MACV NP IFN type-I inhibition . Finally, glutamic acid was replaced by glycine at position166 (E166G) in the polymerase sequence. This mutation resulted in an 8-fold decrease in polymerase activity (mini-genome assay, Additional file 1). MACV and JUNV are closely genetically related, and, indeed, Candid #1, protected guinea pigs and primates from a lethal MACV challenge . Since SABV and CHAPV are genomically closely related , r3MACVwas designed to target MACV, JUNV and each these additional South America arenaviruses responsible of HHF. To replicate the pattern of ther3LCMV construct, reverse genetic systems were designed using synthesized Z, GPC, NP, NP D380A and L genes as well as S and L backbones (Eurofins Genomics, France) based on published sequences (GenBank acc # AY619643 and AY619642). The S and L backbones contained all the non-coding regions of the related viral segment, and the genes loci were replaced by BsmBI (GPC and L loci), BbsI (NP locus) or SapI (Z locus) restriction sites (Fig. 1). These sites were designed to further eliminate all the non-viral sequences after the enzymatic restriction step. Restriction sites required to clone the genes into the backbones or the pCAGGs plasmids were either included during the gene synthesis, or added by PCR using primers with 5′ extensions using the PCR Extender system (5PRIME) or the Q5 High-Fidelity PCR Kit (New England Biolabs), following manufacturer’s recommendations . The E166G polymerase mutation was inserted into the expression plasmids using the Q5 site-directed mutagenesis kit (New England Biolabs). Amplified products were then purified using the QIAquick PCR Purification kit (Qiagen) and digested with the corresponding enzyme (BsmBI, BbsI or SapI, New England Biolabs). Restriction products were gel purified using agarose (Thermo Fisher) and the QIAquick Gel Extraction Kit (Qiagen) then ligated using the Quick Ligation Kit (New England Biolabs). Ligated products were transformed into the NEB 10-β or NEB 5-α F’Iq Competent E. coli (New England Biolabs). The bacterial clones were screened using the PCR (PCR Master Mix, Thermo Fisher) following the manufacturer’s instructions. The positive clones were grown in 50 ml LB broth (Thermo Fisher), then the plasmids were extracted using the Plasmid Plus Midi Kit (Qiagen). Two vectors, kindly provided by JC de la Torre, were used: the pCAGGs vector to express the viral proteins , and the pol I vector to produce the viral RNA segments . The r3MACV genomic sequences are shown in Additional file 2. After the construction and production of the MACV wt and r3MACV, using conditions previously described , viruses were concentrated and purified using an ultracentrifugation step (28,000 rpm for 2 h at 4 °C in a Beckman sw32i rotor) on a sucrose (Life technologies) gradient (20 to 60%). Pellets were resuspended into PBS (Life technologies). We then compared their replication and propagation in VERO cells at a multiplicity of infection (MOI) of 0.01. We observed at 48 and 72 h post-infection (hpi), that r3MACV titers were lower (2 × 104 and 4 × 104 TCID50/ml) than the MACV wt titers (3 × 106 and 1 × 107 TCID50/ml) (Fig. 2a). We also noted that the r3MACV infected fewer Vero cells than the MACV wt (Fig. 2b). In conclusion, the r3MACV genomic modifications resulted in a decrease of the virus infectivity in Vero cells. To test the genomic stability, an additional fifth passage of the r3MACV viral stock was produced using conditions previously described for the production . Briefly, the supernatants from MOI 0,01 infected Vero cells were collected 3 days post infection and centrifuged 15 min, 1610 g, + 4 °C centrifuged before being passaged using these conditions. The viral stock and the late fifth passage were extracted (QIAmp Viral RNA Mini Kit, Qiagen) and sequenced. The experiments were done in triplicate. All results of r3MACV sequencing were similar. Sequencing revealed three changes between r3MACV and MACV wt in the L-segment. Two changes resulted in false sense mutation (T➔C) at position 1733 (leucine ➔ proline) and at position 6598 (serine ➔ proline) in the polymerase. We also identified a 35 nt deletion in the intergenic region (on position 417 to 452). Sequencing revealed one change under one S segment of r3MACV: surprisingly, we found an 1124 nt deletion in the C-termini of the CHAPV GPCΔ33. These deletions were observed in the GP1 and GP2 sequences of the GPC, which are involved in the cellular attachment and entry of the virion [9, 12]. Further experimentations will be needed to understand the consequences of these observations. However we can speculate that an excess of SSP-GP1 residual complex was expressed at the cell surface, moreover this truncated CHAPV GPC was likely not able to produce any infectious virions . No genetic changes in the others genes were identified. In summary, r3MACV showed a moderate genetic stability after 5 passages, regarding the conservation of tri-segmented segments and the mutations inserted. However to support the safety of r3MACV, the deletion inside the CHAPV GPCΔ33 needed to be studied. The deletion of 35 nt in the L segment is interesting. As shown by Golden and his collaborators, a variant of this viral strain, also having a deletion of 35 nt but forward 8 nt (position 409–443) in the intergenic region of L segment, is not pathogenic for guinea pigs . These data suggested a confidence in the safety of r3MACV. Consequently, the CHAPV GPCΔ33 representation in Fig. 1b was not entirely present in the r3MACV virus. To assess that the r3MACV NP D380A mutation removed the NP wt inhibition of the host type-I IFN response, we compared the A549 cells IFN-1β production in different conditions (Fig. 3): infection at a MOI of 3 by MACV wt, r3MACV and Sendaï virus (SeV) a known inducer of type-I IFN . MACV wt was able to produce an infectious progeny (at 3 × 106 TCID50/ml) up to 24 hpi (Fig. 3a) whereas the infectious particles produced by r3MACV were essentially undetectable (Fig. 3a). SeV replication induced the production of IFN-β at an average of 512 pg/ml (Fig. 3b), as previously reported. INF-1 β was undetectable in cultures of MACV wtat 16 and 24 hpi (Fig. 3b) while r3MACV, similarly to SeV, induced 527 pg/ml of IFN-β (average) at 24 hpi (Fig. 3b). We further confirmed this observation using RT-qPCR (Fig. 3c). Together, these findings demonstrated that r3MACV is no longer capable to block the IFN production from infected cells. In order to analyze the protective capability of r3MACV, Dunkin-Hartley guinea pigs (females, 200–250 g, Charles River) animals were inoculated by intraperitoneal injections in a 0.5 ml PBS final volume in a biosafety level (BSL)-4 laboratory (Jean Merieux, Lyon, France). During all manipulation steps excluding weighing (3 times per week), guinea pigs were anesthetized by isoflurane 3% inhalation. Animals were humanly euthanized when end points were attained. The MACV strain Carvallo pathogenicity has been demonstrated in guinea pigs (lethality ~ 60%) [19, 20]. To determine the wt MACV lethal dose in this experiment, two groups of guinea pigs were inoculated using 3 × 104 TCID50 or 106 TCID50. In the two conditions, animals survived, without losing weight and did not develop any HHF symptoms (see Additional file 3). This result indicated that, in our hands, MACV wt was not lethal despite the high doses tested, also a recent observation by other researchers . Therefore, we then chose the Espindola strain of JUNV, closely genetically related to MACV, which was shown to induce 100% mortality in guinea pig, following weight loss and hemorrhagic symptoms . We also selected the Candid #1 vaccine as comparison. Even if it requires 2 months following the vaccination to induce a protection against JUNV , we believed it would add meaningful information, as another live-attenuated virus. Following the JUNV challenge, we administered a low dose of r3MACV and Candid #1. However, the r3MACV dose was 3 times lower than expected because the r3MACV production in VERO cells was low. All control guinea pigs, receiving JUNV and PBS, developed severe symptoms before dying including high weight loss, dyspnea and decrease of tonus (Fig. 4a and b). Similar symptoms and outcomes were observed in all the non-protected animals in other group (Fig. 4a). Animals developing a fatal infection lost from 9 to 34% of their maximum weight (Fig. 4b, c and d). Surviving animals, either in the Candid #1/JUNV group (one, 25%) or in the r3MACV/JUNV group (two, 50%), did not show any symptoms. The Candid #1/JUNV group survivor, guinea pig #1, lost up to 12.8% of its maximum weight from day 16 pi to day 21 pi, then regained 98.5% of its weight (Fig. 4c). The surviving guinea pigs #1 and #4 from the r3MACV/JUNV group, regularly kept gaining weight, reaching at the end of the experiment 155 and 138% of their initial weight, respectively (Fig. 4d). 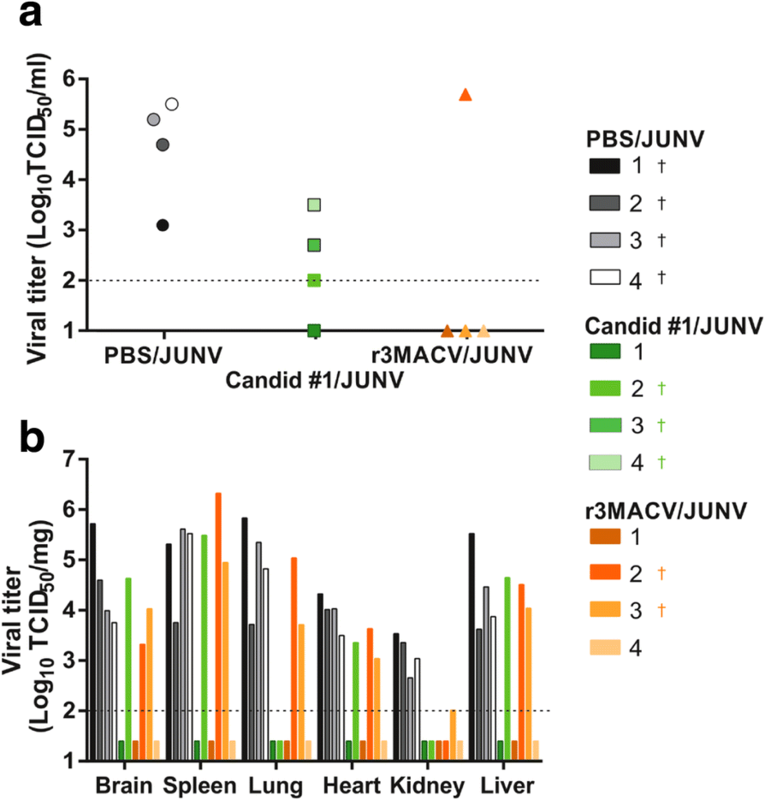 All guinea pigs which succumbed to the infection showed a detectable JUNV viral load in their serum at day 14, except guinea pig #3 from the r3MACV/JUNV group, which died at 26 dpi (Fig. 5a). We observed that when the guinea pig JUNV viremia was above 102 TCID50/ml at day 14, the guinea pig died between 14 and 21 dpi. None of the surviving animals exhibited any detectable viremia at day 14. All dead animals had detectable virus titers in all tested organs except in the lung of animal #2 of the Candid #1/JUNV group, and in the kidney of animal #2 of the r3MACV/JUNV group. All surviving animals did not exhibit any detectable viral titer in tested organs (Fig. 5b). In conclusion, our study demonstrated that the r3MACV candidate was able to protect 50% of guinea pigs from a simultaneous lethal JUNV challenge. Surviving animal displayed neither clinical symptom nor detectable infectious virus in collected samples. This protection was higher as a therapeutic treatment than that provided by Candid #1 (as a vaccine requiring two months for immunity with variable efficacy against different JUNV strains ). Moreover protection occurred at a 3-fold lower dose of r3MACVthan Candid #1. Several factors may be considered: (i) as observed in vitro, the r3MACV might have induced a high level of type-I IFN production, resulting in the establishment of an antiviral state preventing the JUNV propagation, ultimately resulting in the control of the viral infection by the host immune system; (ii) the r3MACV might have competed with JUNV to enter cells, or induced the superinfection exclusion phenomenon , thereby limiting the ability of the pathogenic JUNV to infect animals; (iii) the r3MACV might have also elicited an adaptive immune response. These hypotheses will need to be tested in future experiments. We could not test the attenuation of the r3MACV in a MACV wt lethal challenge as noted (Additional file 1) and it could be studied if such a successful animal model is identified. However, these studies suggest thatr3MACV will be a safe product because (i) the tri-segments modification of the mammarenavirus genome was associated with an attenuated phenotype , (ii) the NP D380A mutation was shown to block the inhibition of the IFN-1β production in A549 cells, (iii) the 2-log reduction ability of the r3MACV to grow in VERO cells, (iv) a MACV and JUNV recombination viruses could not be excluded but likely improbable . Regarding the efficacy of Candid #1 as a therapeutic vaccine, we showed that it was less protective than the r3MACV despite its closer antigenic relationship with the virus used for the challenge. If the r3MACV fulfills the necessary requirements in term of safety and antigenic expression of GPCΔ33 inserted in each S segment, further experiments will be needed to address its potentially therapeutic and prophylactic protection against MACV and JUNV and ultimately against other South America arenaviruses responsible for HHF. The authors thanked Dr. Sébastien Emonet for his scientific advice and involvement in design of this study. We are grateful to Fanny Jarjaval, Isabelle Drouet, Lisa Lartigau and Dr. Marie Moroso for their technical support. We thank Pasteur Institute (UBIVE) for providing us with the Sendai virus. We also thank P4 in vivo team for the realization of the experimental study in the BSL4 Inserm-Jean Mérieux. We are indebted to Dr. Marti Jett for revising the manuscript. This work was supported by a DGA-MRIS scholarship to A.D.Z., n°007/2014/DGA. The funder had no role in study design, data collection and analysis, or preparation of the manuscript, but had role in decision to publish. The research was partially funded by the Direction Générale de l’Armement and the Service de Santé des Armées, Biomedef PDH-2-NRBC-3-B2–304. The funder had no role in study design, data collection and analysis, decision to publish, or preparation of the manuscript. ADZ, CHH and CNP designed this study and analyzed the results. ADZ performed the experiments. ADZ drafted the manuscript. CHH and CNP revised the manuscript critically. All of the authors read and approved the final version of this manuscript. All experiment in guinea pigs were approved by an external ethic committee named CECCAPP N°CEO15 (Permit number APAFIS#8168–201,611,241 017566 v2) according to the Directive 2010/63/EU in Europe.